Young orphan Lewis Barnavelt aids his magical uncle in locating a clock with the power to bring about the end of the world. 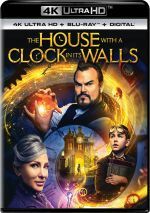 Adapted from John Bellairs’ novel, 2018’s The House With A Clock In Its Walls takes us to 1955 and introduces us to fourth grader Lewis Barnavelt (Owen Vaccaro). Recently orphaned, he goes to live with his Uncle Jonathan (Jack Black) in Michigan. Once Owen arrives at his uncle’s quirky home, he encounters a mix of odd experiences and soon learns that both Jonathan and neighbor Florence Zimmerman (Cate Blanchett) possess magical powers. Eventually Jonathan reveals that a mystical clock resides in the house’s walls, and the trio need to discover it before it causes untold mayhem. When I saw ads for House, I assumed it brought a second chapter in the Goosebumps series. After all, Black starred in the first film, and House looked like a very similar effort. 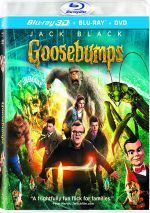 Adding to the confusion, a second Goosebumps hit screens a few weeks after House. Of course, the trailer for House made it clear it wasn’t another Goosebumps, but I still wonder if the two canceled out each other at the box office, as neither found much of an audience. I can’t claim that the lackluster ticket sales of House create a tragedy. While a watchable affair, the movie fails to bring out a particularly evocative adventure. For lack of a better term, it simply lacks the magic it needs. The movie portrays a slew of fantastic events but boasts no sense of excitement or whimsy about them. Action and mayhem happen without much sense of discovery or the notion anything special is at work, and that seems odd. We have a Harry Potter-esque lead who gets introduced into the world of magic without any impression that it's a big deal. Best known for graphic, violent horror like Hostel and Cabin Fever, director Eli Roth branches out with this family-friendly fare. Unfortunately, he can't bring life or charm to the proceedings. All of this results in a perfectly watchable 105 minutes but not anything that dazzles and charms like it should. House comes with the potential to be a lively fantasy but it feels ordinary and restrained. The House With the Clock In Its Walls appears in an aspect ratio of approximately 2.39:1 on this Blu-ray Disc. This became a consistently strong image. Colors favored a mix of teal and orange. The hues came across as well-developed given their stylistic orientation. In addition, the film’s Dolby Atmos soundtrack proved to be top-notch, with a vivid, involving soundscape. Downconverted to Dolby TrueHD 7.1, the movie boasted a slew of magic scenes, and those used all the channels in a lively, engaging manner that brought out a good sense of the material. I felt especially pleased with the precision of the mix, as it located different elements in an accurate manner. These elements blended together nicely and created a smooth, 360-degree setting that seemed well above-average. The disc comes with a slew of extras, and these start with an audio commentary from director Eli Roth and actor Jack Black. Both sit together for a running, screen-specific look at story/characters, cast and performances, sets and locations, effects, and connected domains. Though Roth and Black touch on a decent number of movie-related subjects, much of the commentary seems freewheeling, so they often go “off-topic”. I don’t mind this, as the track becomes pretty entertaining, largely due to Black’s contributions. Nothing here threatens to make this a great chat, but it’s fun and just informative enough to give it substance. We find an Alternate Opening (4:08), an Alternate Ending (1:24) and nine Deleted Scenes (9:20). The “Opening” introduces our magical adults much earlier, whereas the “Ending” simply adds a little glimpse of how the characters live their lives. I agree with the excision of the “Opening”, as it tells the audience too much too soon. The “Ending” offers minor fun, though, and would’ve been a harmless addition. As for the “Deleted Scenes”, they bring us a few decent character beats and a little extra exposition. None of them seem especially valuable, but a few offer entertainment. All of these can be viewed with or without commentary from Roth and Black. They tell us about the shots as well as why they failed to make the final cut. Black and Roth add some useful insights, and Black throws out some funny bits as well. A Gag Reel goes for three minutes, 33 seconds and presents a fairly typical compilation of goofs and giggles. A few improv bits make it a bit more interesting than usual, but not much. Plenty of video footage follows, and we start with Warlocks and Witches, a nine-minute, 58-second compendium of four clips. Across these, we hear from Roth, Black, and actors Lorenza Izzo, Owen Vaccaro, Cate Blanchett, Kyle MacLachlan, and Renee Elise Goldberry. In these, we learn about cast, characters and performances. A few good shots from the set appear, but the comments tend to seem superficial. Across “Magic”, we learn about sets, props and production design, and some practical effects. The featurettes mix useful observations with happy talk. We look at the source via Tick Tock, a three-minute, 27-second show with Roth, Black, Blanchett, screenwriter Eric Kripke, and producers James Vanderbilt and Bradley J. Fischer. We learn about the original novel and its adaptation. Only basic material appears, so we don’t learn much. Six sequences appear under Eli Roth: Director’s Journals, a seven-minute, 23-second compilation. In these, Roth takes us to various sets to give us info about these spots and other details. Like the prior programs, the “Journals” tend to be glossy, but Roth manages to wring a few useful notes out of them. Four more clips show up via Owen Goes Behind the Scenes. In total, these fill four minutes, 11 seconds with material that resembles “Journals” except from Vaccaro’s point of view. The result feels cute but insubstantial. A Theme Song Challenge lasts two minutes, 48 seconds and features Roth, Black, Vaccaro, Izzo and MacLachlan. They attempt to create a new song for the movie in this wacky – and fairly annoying – promo clip. Another comedic bit, Do You Know Jack Black? runs four minutes, one second. Black asks Izzo, MacLachlan and Vaccaro to answer questions about his own life and career. It’s meant to sell the movie but it’s actually pretty fun. With Abracadabra!, we find a one-minute, six-second clip with Roth and Vaccaro. Here Roth performs a card trick for Vaccaro. Another promo piece, it seems mildly entertaining. Jack Black’s Greatest Fear goes for one minute, 27 seconds and includes Roth and Vaccaro as they discuss a prank they pulled on Black. It proves surprisingly dull. Finally, The Mighty Wurlitzer fills two minutes, 26 seconds with Roth and composer Nathan Barr. We get a few notes about the film’s score in this short but moderately informative clip. The disc opens with ads for Johnny English Strikes Again and Mary and the Witch’s Flower. No trailer for House appears here. As an action-fantasy, The House With A Clock In Its Walls offers the potential for a vivid adventure. However, the movie lacks figurative magic and feels oddly flat too much of the time. The Blu-ray boasts excellent picture and audio as well as a nice compilation of supplements. While this becomes a good release, the film itself never offers more than moderate entertainment value.